Prophet by Brandon Graham, Simon Roy, Giannis Milonogiannis, Farel Dalrymple, Joseph Bergin III, Ed Brisson, Malachi Ward, Matt Sheean, and friends is easily my favorite comic on the stands. 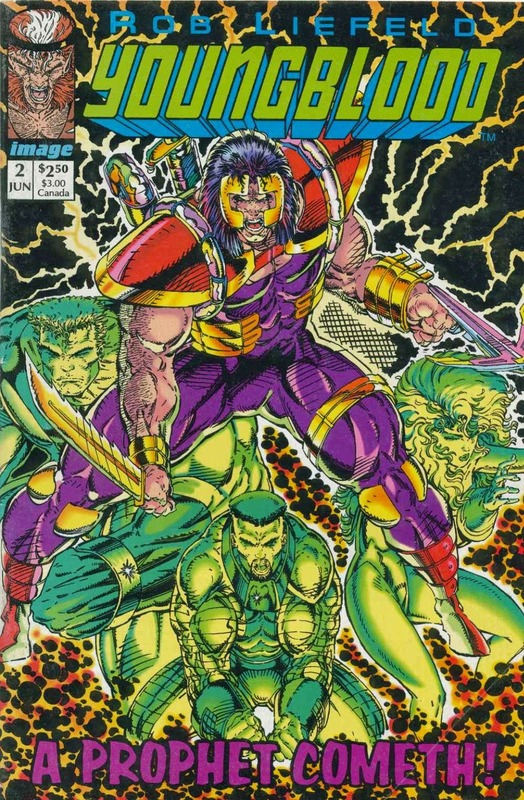 Going into the series I was aware that it was a relaunch of one of Rob Liefeld’s old Extreme Studios’ property but lacked any knowledge on Prophet’s history beyond that. Now, as Prophet prepares to begin a climactic chapter with Earth War, I find myself curious about the origins of this comic that I am so fond of. Unfortunately, I missed the boat on Extreme Studios and all the other early Image comics the first time around. Fortunately, this means I can read peak 90’s comics like the entire run of Prophet pre-2012 relaunch with virgin eyes and chronicle such an experience. My mission statement for this continuing series of posts on Prophet is to do close readings and critical analysis of each old issue all the while trying to construct a map of how these comics from the decade of Extreme connect to the Prophet of today. More than likely though, this pseudo-academic exercise will devolve into me just pointing out the raddest parts of the comics. The very first page of the comic is a splash page of not-X-Force running straight at you as the assumed leader yells out a surprisingly restrained and natural bit of exposition while 2 other members quip in a way that lets you know this is a team of badasses. In one page everything is set up and despite being unfamiliar with who any of these characters are I immediately understand a great deal about them. Capping the page off is a respectful dedication to Jack “The King” Kirby. A very pressing criticism of the Rob is his tendency to draw his characters not really interacting with objects and other characters that they are clearly supposed to be interacting with. Commonly this takes the form of weapons being not so much held as merely placed on hands. 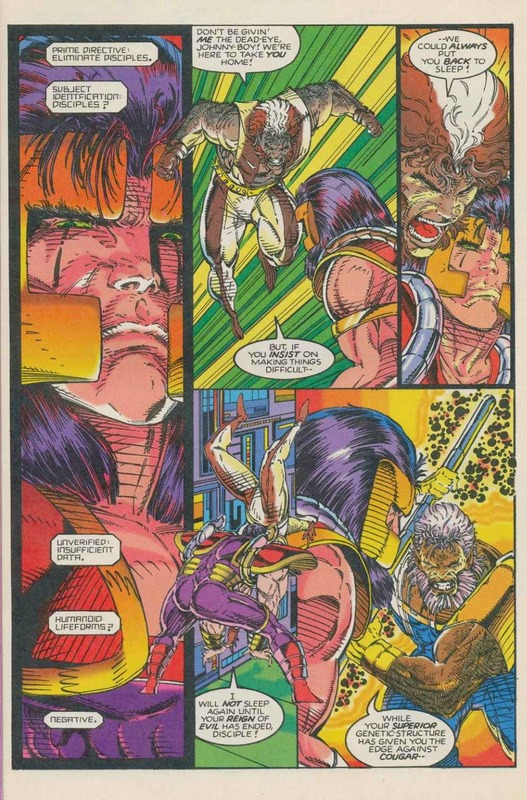 Unfortunately this failing of Liefeld’s is on display early in this comic as many panels look like images cut from somewhere else and then placed in a proximity that would imply interaction. It seems that the team of hardasses on a mission are called the Berzerkers, and their individual names are just as metal as their team name (Wildmane, Battleaxe, Psi-Storm, Cross, and Grey [they can’t all be winners]). Turns out the mission they were on was to rescue Jack Kirby as drawn by Rob Liefeld (there is not a more accurate way to describe the character of Kirby other than that). Kirby has rescued himself however, because he’s Kirby after all, and he has huge Liefeld guns. Having rendezvoused they can set their sights on taking down the big bad guy who must live his life in the squat rack. It’s not until the 5th page that Prophet appears on what is the title page of the issue, which serves as the warm-up for some exposition, accompanied by a vertical 2 page splash. A group of characters pose as they all takes turns helping Professor Exposition explain how Jonathan Taylor Prophet is at least 80 years old and the product of a mad scientist’s World War II experiments. Despite the conversations being stilted in nature for the purpose of moving the plot along it does so rather rapidly with a relatively low word to page ratio. Oh, and one character remarks that Prophet has some “funky threads” while an ostensible alien provides the counterpoint of, “On my homeworld he would be dressed as a warrior.” One man’s funky is another race’s battle armor. The page after the unusually oriented two-page spread undoes my previous word/page ratio praise as giant pink text boxes and generic test images crowd the page. However, one box has an observation of Prophet’s attire that exceeds the greatness of the previous page’s exchange as the professor acknowledges that Prophet’s creator outfitted him in “outlandish uniform and equipped him with weapons far beyond the limits of even today’s science.” I’d like to believe this is a hint of mocking self-awareness. 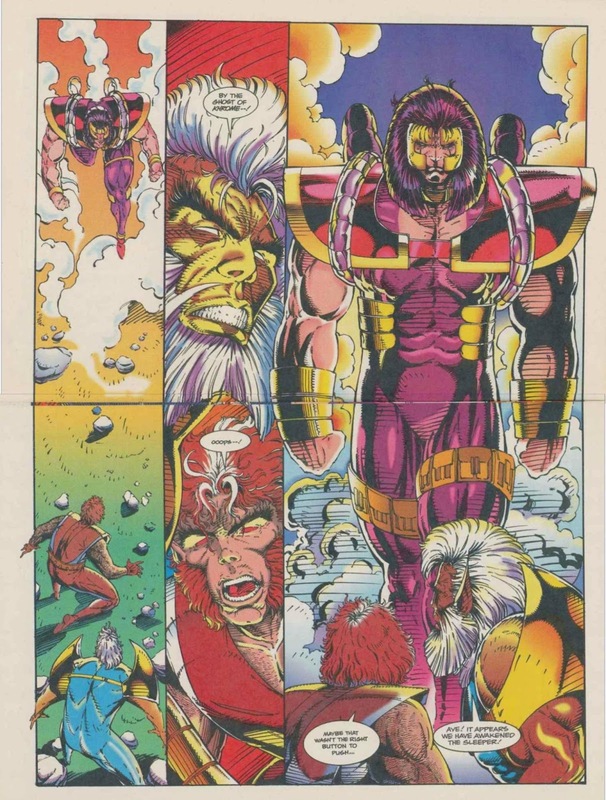 As if knowing that that necessary evil of using words to establish things is over, Liefeld really introduces us to Prophet by making him explode out of his cryogenic animation chamber in a vertical two-page spread that does a great job of making him seem physically intimidating. In case Prophet’s physique and body language didn’t already evoke a Terminator vibe he certainly does now as he receives a robotic readout of “prime directive” and “subject identification” (through an assumed heads up display) all the while giving just the best scowl. The little I know of this version of Prophet indicates that he is a good guy, and it would stand to reason that the Younglood(s) are good guys too, so it is only natural that the standard hero crossover thing happens where they have to first fight each other before they can team-up. The set-up for this fight is pretty good though as the members of Youngblood that Prophet is first confronted with are not human, so Prophet assumes humanity has been destroyed/subjugated and attacks these assumed evil overlords. In the world of superheroics that is a surprisingly well thought out catalyst for a hero vs. hero action scene. The fight between Prophet and Youngblood is some real fun stuff too with the momentum of the battle continuously shifting back and forth as Prophet keeps coming back from everything the Bloods can throw at him. The whole fight is drawn in a way that is incredibly fun as large kinetic panels of big attack posing are linked with smaller transition panels. Embellishing the fight is above average witty quips with all of Prophet’s battle dialogue being absolutely A+. Also, I don’t care how screwy the scaling in this comic gets as it’s all in service of getting the action across, and what it’s getting across here is that this punch is the biggest goddamn punch ever thrown. Generally I’m against reviews and other scholarly type posts that veer too far into summary territory, so now I’ve become what I dislike (hate is a strong word). I apologize for the summary nature of this post as I got sucked into the infectious joy that pervades the comic as it traverses from one incredibly comic book moment to another. Hopefully in future posts I can contain myself and remain a bit more analytical in my discourse. 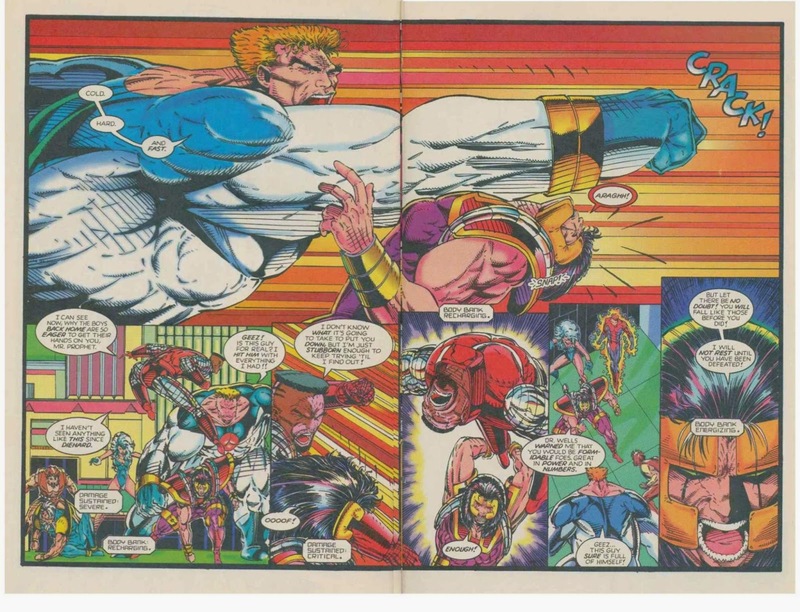 Rob Liefeld loves comics and this issue makes that much clear by being full of action and bombast. What’s not so great is that it makes a lot of mistakes that many comics do. These faults are deeply connected with Youngblood #2’s strengths in that the comic is an exaggeration of comics. A staple of the medium is dudes in weird colorful costumes punching each other; however another staple of the medium is overwrought explanatory dialogue full of nonsense words to create inflated importance. Both are present within these pages creating an uneven story with high points of over the top action and low points of boring transition scenes. Thankfully there is a lot more punching/shooting/slashing than standing around. Continuing the thread of craft, there are a surprising amount of vertical two-page spreads. The use of vertical spreads in comics at large is minimal, so to see 3 in one issue is shocking. The vertical spread after Prophet explodes out of the tube is probably my favorite page of the issue as it quickly establishes how powerful the new character of Prophet is before he even throws a punch. Seeing as how I read this comic because it is the first appearance of Prophet I enjoyed the prominence the character was given, however I still know next to nothing about Youngblood besides a general grasp of their standard powers and that one of their dudes is an alien and the other a beastman. 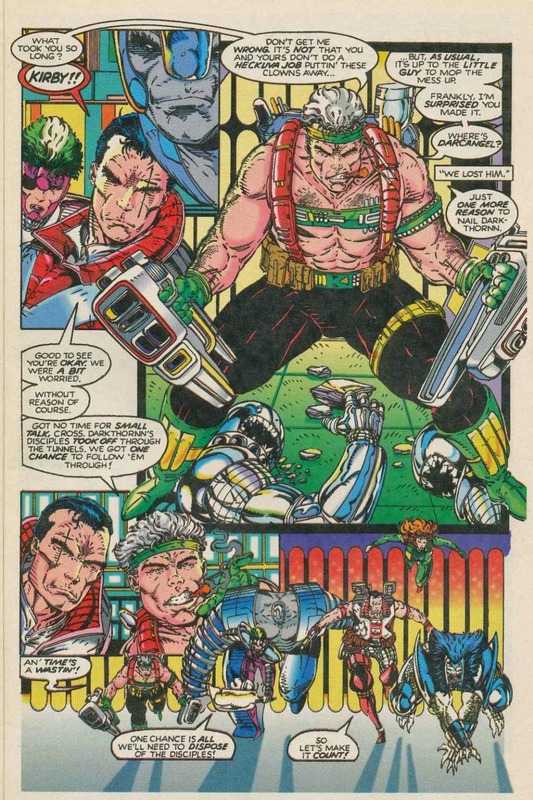 It is as if Liefeld got so excited about his new toys that he forgot about his old ones, and in the second issue of a new series that is a major concern. As I begin my journey through these old Extreme Studios comics one thing that I am looking for is how connected they are to the modern day version of Prophet. Superficial changes are to be expected, but there should be something tying the two incarnations together. One issue into this quest and certain continuous aspects have already appeared. The easiest to pick up on is Prophet being a man out of time. Much like the New Father discovering an alien Earth in the Prophet relaunch, the original Prophet awakes in the 90’s which is much different than the 30’s-40’s that he was seemingly created in and is first greeted by two alien individuals. Including an actual alien element in the reawakening is a physical manifestation of temporal displacement, which takes Prophet’s obvious Captain America influence to an extreme. Prophet being a thrall to a built in set of directives is another bit of continuity carried forward by Brandon Graham and friends. It will be interesting to see in the solo series if this conflict will remain internal or given a form like the Earth Empire in current Prophet. All in all Youngblood #2 was a damn fun comic and makes me even more excited to dig into Prophet proper. Future posts will be kept shorter and more focused, but no promises. Next time I’ll take a look at the first issue of Prophet’s solo series in hopes of discovering more influences on my favorite comic book and just general radness.